Ski and Snowboard Australia, in conjunction with NSW Cross Country and NSW Biathlon Association, hosted an SSA Futures camp in Sydney over the weekend with over 40 athletes attending. Do you have a desire to pursue coaching at a higher level and want to know more about what goes on at the national level with Australia’s best XC athletes? This is your chance! Ski & Snowboard Australia is pleased to announce an assistant coaching opportunity for a recently trained cross country ski coach looking to gain high level coaching experience. In June and July national team camps are being held and one lucky coach will be given the opportunity to attend one of the following camps as an observer and an assistant coach. Coaching would be alongside AUS XC head coach Finn Marsland, working with athletes from the World Cup and Continental Cup teams. The coach would get to observe national team physiological testing protocols, assist with running of the tests and be involved with interpretation of test data with the head coach and athletes. Accommodation and meals at the AIS would be provided for 3 days, plus partial reimbursement of travel money. Ski and Snowboard Australia, NSW Cross Country and the NSW Biathlon Association partnered up last Saturday 10 May to put on “Roller Ski with an Olympian” at the Sydney Olympic Park. The day was a great chance to raise the profile of Nordic sports in Sydney as well as to kick start fundraising for athletes towards the 2018 Winter Olympics. Sochi 2014 Winter Olympians Esther Bottomley, Lucy Glanville, Alex Almoukov and Slovenian Barbara Jezersek all participated in the event, assisted by Olympic Biathlon and Cross Country coaches Nick Almoukov and Finn Marsland, XC National Coaching Director Allison Stoddart and Biathlon National Team athlete Daniel Walker. The SSA Futures Program is in full swing again this season with a number of dryland programs available ahead of the snow season. The most recent program was for those young Cross Country skiers around North East Victoria. Australian Cross Country Ski Team members, Paul Kovacs, Anna Trnka, Xanthea Dewez and Ash Kildea, and National Junior coach and organiser of the SSA Cross Country Futures weekend, Nick Grimmer, showed the aspiring young skiers what it takes to be a champion. The Athlete Representative may also have an active role on other sub-committees depending on their personal skills and experience. 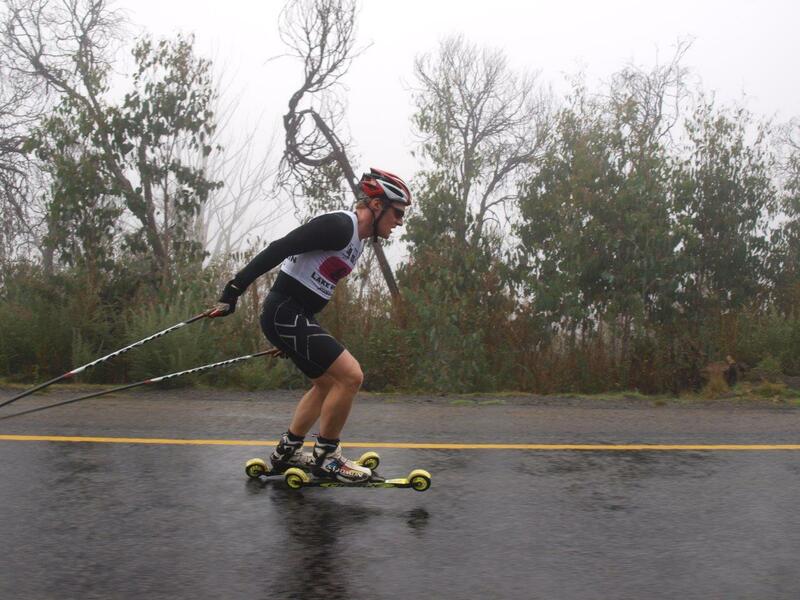 On Sunday 11th May 45 rollerskiers and ‘Skikers’ braved wet conditions to compete in the Victorian Rollerski/Skike Championships at Lake Mountain. Competitors had the choice of either a 10km or 4km hill climb and although the rain made the conditions more challenging, all enjoyed the event. This was an increase on the numbers of the race last year which was good considering the wet conditions. World Cross Country Ski Championship skiers Nick Montgomery and Casey Wright were clear winners of the 10 km men’s and women’s, Hugh Pollard and Katerina Paul won the junior category while Meg Watkins was a clear winner of the 4km event. The event coincided with a range of activities including a training camp for the Victorian Junior XC Ski Squad; laser biathlon come and try session run by the Australian Biathlon Association; a demo trade display by the people from Team Skike; and a learn to rollerski clinic run by Melbourne Nordic Ski Club. The 2014 Ski & Snowboard Australia Awards were held in Melbourne last Thursday evening May 1. The overall Snowsports Athlete of the Year award was shared between Sochi 2014 silver medalists David Morris (Freestyle Aerials) and Torah Bright (Snowboard). The rest of the awards and summary of the evening can be read about here on the SSA website.